It is a matter of public record where Drew Magary, the beloved honking prince of this website, lands on the question of pancakes. The big dog is pro-flapjack without apology, and our boy likes them large. But while Drew is recovering well from his post-Deadspin Awards injury, he was not in the studio for the recording of this week’s all-food, all-Funbag Deadcast. This meant that the job of defending pancakes from the withering slander of Megan Greenwell and the slightly less vigorous criticism of Tim Marchman fell to me. I did my utmost, although if I’m being honest I 1) eat the same spartan breakfast basically every day and 2) also found it easier to defend French toast against Megan’s brutal broadsides. 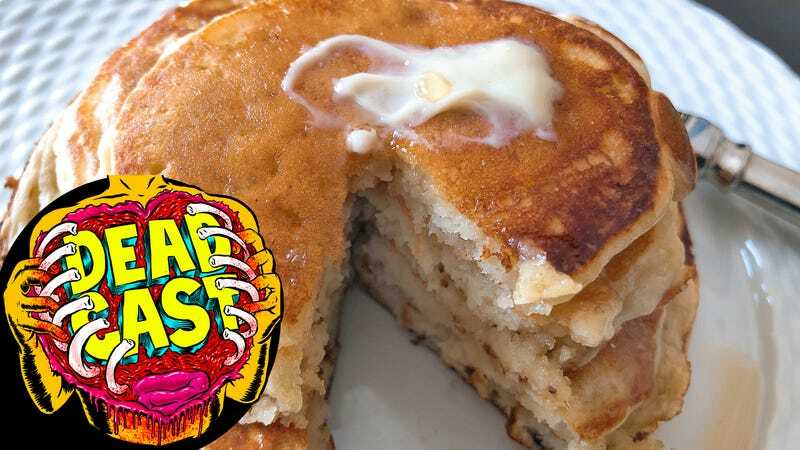 More than that, though, this polarizing breakfast-food question came early in the podcast and it seemed more important to stay fresh and hungry than to sell out protecting pancakes. You gave us a lot of garbage to eat this week, and I wasn’t trying to fill up on perfectly acceptable breakfast fare before we got to the damn mains. And we feasted, friends, and not just on breakfast-related questions. Tim, Megan, and I are all slightly different types of obnoxious food dipshits, and your questions gave us plenty of opportunities to play to our respective but equally unbearable strengths. We addressed the worst non-fat and low-fat variations on beloved foodstuffs, shared our most frustrating wack meal experiences, bickered childishly over condiments, and explored the eternal question “What Is A Baking Supply, Really?” There was also a truly horrifying tale of eating expired food at an in-law’s, which I have thought about regularly since we recorded and do not expect to stop thinking about anytime soon. We also spent more time discussing the question of whether Donald Trump has ever used a bidet than is remotely excusable, and much of that discussion was my fault. I apologize for it. It had been a long day and I had opinions on the matter. One additional broadcasting note: given the exigencies of scheduling during the holiday season, this podcast was recorded before Megan could be held to account for the “ham is mostly terrible” take she snuck into this week’s Funbag. Rest assured that she will be forced to answer for it in the future. Accountability will be a watchword in 2019, if only where baked porks are concerned. Possibly elsewhere if there’s time, but for sure with the ham slander. That’s my promise to you.